When photographed here in Tilbury, the roll-on/roll-off cargo vessel BAZIAS 7 (2462 tons gross, 4565 deadweight) was in the early stages of a varied career. She had been completed in 1983 at a shipyard in Galati, Romania, for a Norwegian outfit that placed the vessel under Liberian flag as BALDER VIK. 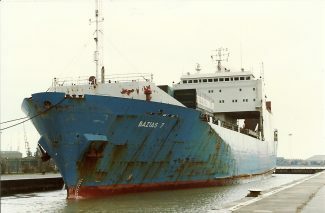 Following some financial problems, the vessel was effectively returned to Romania and it came under the ownership of Intreprenderea de Exploatare a Floti Maritima, of Galati, in December 1986 and started in service from London to Zeebrugge in January 1987 as BAZIAS 7. She has been involved in charters ever since, and in 1989 became STENA TOPPER, operated by Stena Line. With a few more names and owners in between, she became HANSALAND under the flag of Bahamas in 2005 and, operated by Imperial Shipmanagement, of Gothenburg, Sweden, is now running on regular service from Marseilles to North Africa.